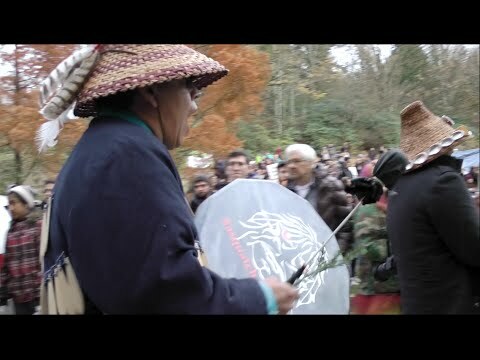 On November 14th an injunction (http://www.courts.gov.bc.ca/jdb-txt/SC/14/21/2014BCSC2133.htm) was granted in favour of Trans Mountain preventing people from preventing work at two bore hole sites on Burnaby Mountain and one site at Barnet Marine Park. Yesterday, November 17th, at 4 o'clock the deadline came and the injunction went into effect. The people gathered in the camp and in the clearing across the street remained in place, and many more continued to stream up the hill, with the number gathered only growing into the evening. Much of the rally consisted of many different chants, often starting spontaneously, before, after and during several speeches spread throught the evening. After dark there were musical performances including those from the Solidarity Choir & Holly Arntzen.